The themes of 2017’s parades range from swashbuckling pirates to celebrating everyday heroes. SOUTHERN CALIFORNIA — Winter is right around the corner, which means one thing: It’s time for boat parades up and down Southern California’s coast. Boaters, kayakers and others will deck their craft with lights, decorations, and music in the days leading up to Christmas. Each harbor along the Southern California coastline will host its respective annual holiday boat parades. Mild winter weather from San Diego to Santa Barbara certainly provides an ideal environment for boat parades to christen the holiday season. Decorated boats participating in the parades will have a chance to win in various categories as they cruise along the water. There may be a fee for boating participants. It is free for the public to view and enjoy the festivities. Spectators can also consider making a reservation for a harbor cruise or at a waterfront restaurant to view a parade. Details regarding the numerous merry maritime events are provided here. Whichever boat parade you end up attending, be sure to enjoy all the lights and festive cheer. Details: The 46th Annual San Diego Bay Parade of Lights, presented by the Port of San Diego, returns Dec. 10 and 17. The theme is “Arrrgh! A Pirate’s Christmas.” San Diego Bay Parade of Lights was one of 20 candidates for USA Today’s “Best Holiday Parade” competition. Voting for the competition runs through Dec. 4; please visit 10best.com/awards/travel/best-holiday-parade-2017/ to vote. More than 80 boats are expected to participate. Those boaters participating in both nights of the parade and viewed by the judges are eligible to win various awards and prices. The grand prize is a luxury cruise package for two with all the amenities of a private mega-yacht. The entry fee is $60, which covers parade participation for both evenings and includes two complimentary reservations to the awards presentation dinner. There will be an awards presentation dinner at Tom Ham’s Lighthouse on Harbor Island, Jan. 11, 2018. Route: Beginning at 5 p.m. each night, the parade starts at Shelter Island and proceeds to Harbor Island, the Embarcadero, Seaport Village, the Pier at Cesar Chavez Park and ends at the Ferry Landing in Coronado. Viewing: For the first time this year, the parade will proceed to the pier at Cesar Chavez Park before making the turn to Coronado. The parade takes about an hour to pass any given point. Spectators are encouraged to plan ahead or take the trolley to avoid traffic and parking issues. Details: This annual holiday parade will be held at San Diego’s Mission Bay and features dozens of decorated boats. Admission is free. Route: Decorated boats circle around Mission Bay, starting from the Quivira Basin area. Viewing: Best viewing is from Crown Point, the east side of Vacation Island and west side of Fiesta Island. Information: Call 858-488-0501 or go online at bit.ly/2fZCelI. Details: Oceanside Yacht Club presents the Parade of Lights. Boats participating must register and obtain a number to enter the contest. Deadline to enter is Dec. 9 at 2 p.m. Participants can sign up at the Oceanside YC during business hours posted on website oceansideyc.net. Best time to register would be at the Skipper’s Meeting (Dec. 9, 2 p.m.). Judging and awards will take place at the yacht club after the parade. Route: The parade will loop twice around the inside of the Oceanside Harbor. Viewing: The best viewing location, according to an official San Diego city blog, is near the fishing dock and police station. Information: Call Oceanside YC at 760-722-5721. Details: The 43rd Annual Dana Point Harbor Boat Parade of Lights’ theme this year is “A Superhero Holiday.” Each night will feature carolers, games, crafts and free photos with Santa Claus. Festivities begin at 4:30 p.m. each night of the boat parade; the parade itself begins at 7:30 p.m. Viewing the parade is free. Submit an entry form online at danapointharbor.com/. Route: A map of the boat parade route is available online at danapointharbor.com/boat-parade-of-lights/. Viewing: The parade can be viewed for free from anywhere in the Harbor, or make reservations at one of the restaurants to view it. Information: Call the Harbor Info line at 949-923-2255, email info@danapointharbor.com or visit website at danapointharbor.com. Details: The Newport Beach Boat parade, hosted by the Commodores Club of the Newport Beach Chamber of Commerce, is the nation’s longest running holiday boat parade. This is also the biggest harbor parade in California. The New York Times hails it as one of the top holiday events in the United States. More than 100 decorated boats are expected to participate. The boat parade begins east end of Lido Island. The first viewing destination will be at Marina Park. Call 949-729-4400 for specific questions about entries. The entry fee is $35. Route: The route of the parade can be viewed online at christmasboatparade.com/. Viewing: Spectators can view the parade at several locations, including Marina Park, 10th Street Beach, Balboa Village Boardwalk, M Street Pier, West Jetty View Park, Lookout Point, China Cove Beach, Balboa Island and Via Lido Park. Information: For all the details, go online at christmasboatparade.com. Details: This year’s holiday boat parade theme is “Musical Kicks on Route 66.” New and previous participants are encouraged to display music and lights from all cultures. There are 16 trophies to be awarded to boating participants from various categories including “Most Religious” to “Best Commercial Entry.” Deadline to enter: Dec. 8. The parade will be shown on Ch. 3 over the holiday season. To enter a boat in this parade, go online at hhboatparade.org/entries. Line up for the boat parade is at 4:30 p.m. Parade starts at 5:15 p.m. sharp. Route: The parade route can be viewed online at hhboatparade.org/parade-route. Viewing: Viewing areas are limited from outside the harbor area and parking is quite limited. Those that will have the best views are those that have a residence in Huntington Harbour or have a watercraft. Information: Visit hhboatparade.org or call Eva Kilgore at 714-397-0002 or Mike Novak at 714-270-7109. Time: Streets close at 5 p.m. The large boat parade starts at 6 p.m. The small boat parade starts at 6:30 p.m. Details: The theme this year’s annual holiday boat parade at Naples Island is “The Canals are Alive with the Sound of Music.” On the night of the parade, all large boats will assemble along Lido Lane and off the sea wall in front of Naples Plaza. All the small boats will assemble in Marine Stadium. Local streets close at 5 p.m. The Naples Improvement Association hosts this holiday parade (not a Long Beach Yacht Club event). For those participating in this boat parade, a mandatory skippers’ meeting is being held Dec. 6 at 7 p.m. at the Long Beach Yacht Club in the Regatta Room. Only boats with official parade numbers will be allowed in the canals. The entry fee is $45 per boat and $25 per kayak. Boat entry forms are available online at naplesca.com/Parade_Entry_Form.php. Viewing: Spectators can view the parade from the Naples’ canals and various bridges as well as along the bay. Free parking is at Alamitos Bay Marina off Second Street and Marina. Metered parking is at Mothers Beach off Ravenna and Appian Way. Beach parking is at Bayshore and Ocean Boulevard. There are public restrooms at Mothers Beach and at Bayshore and Second Street. Details: The 26th annual King Harbor Boat, hosted by King Harbor Yacht Club, will be celebrating a “California Christmas.” The parade will have decorated boats and paddle craft circling the King Harbor Marina. KTLA Meteorologist Vera Jimenez is this year’s Grand Marshal; Disappearance is the Grand Marshal boat. DJ Skeeter will provide music. 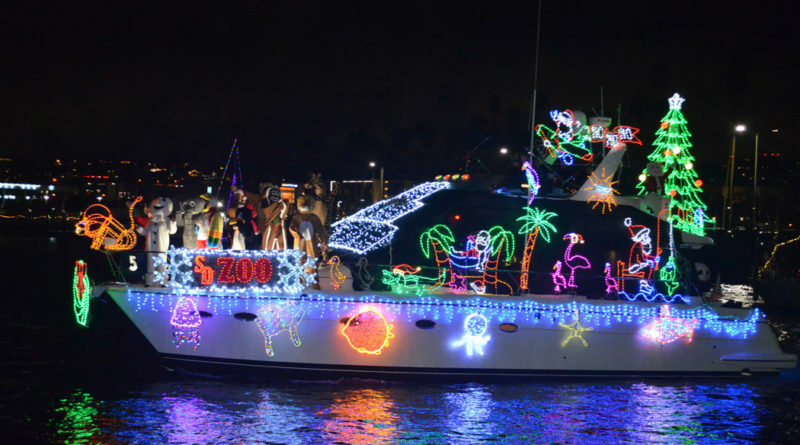 The holiday boat parade will benefit King Harbor Youth Foundation, Redondo Beach Rotary, Santa Monica Bay Maritime Training and Waterfront Education. The entry fee is $30 for boats and $15 for standup paddleboards. Contact Tracey McMartin at kelbo8@aol.com or Denise Harkins at hark1203@sbcglobal.net. A trophy presentation dinner will be held after the parade ($15 for adults $10 for children 10 and younger). Route: The Parade Route is counter-clockwise with three passes in front of King Harbor Yacht Club. Viewing: Best viewing locations are at King Harbor Marina/Moonstone Park (free bleachers for first come/first serve), Redondo Beach Marina Sportfishing Pier and Seawall, Portofino Hotel and Marina Lobby and Seawall as well as Seaside Lagoon Seawall. Information: Visit khyc.org for more information. Details: L.A. County Supervisor Janice Hahn is this year’s Grand Marshal. The Exy Johnson and Irving Johnson, the official Tall Ships and Maritime Ambassadors of the City of Los Angeles, along with vessels of all shapes and sizes will participate including powerboats, sailboats and harbor working craft. Entries will be judged and trophies awarded for various classifications, such as Originality, Theme, Type of Entry and more. The parade will again be televised via LA36, Los Angeles Community Television cable channel. Home viewers may also watch the parade on Los Angeles CityView Channel 35. For air times, visit lacityview.org. The parade will begin at the Port’s East Basin. Route: The parade route and viewing times for various locations are available online at laharborholidayafloat.org/parade-route-2/. Viewing: Wilmington: Banning’s Landing, Wilmington Marinas; San Pedro: Downtown Harbor, LA Maritime Museum, Battleship Iowa, Ports O’Call Village, Warehouse #1, Cabrillo Way Marina, Cabrillo Marinas (California Yacht & Holiday Harbor), SS Lane Victory (Kaiser Point). Information: Information is available online at laharborholidayafloat.org. Details: As many as 25,000 people are expected to attend the annual Marina del Rey Holiday Boat Parade, which features Headline News journalist Carol Costello as its Grand Marshal. This year’s theme is Let’s Dance. Traditional fireworks that annually noted the beginning of the boat parade will be shot off the south jetty of the marina at 5:55 p.m. Paid parking is available at county lots($5 and $15), Burton Chace Park (Lots 4 and 77) and Fisherman’s Wharf ($1 per 20 minutes, $15 maximum, pay attendant upon exit). Route: Fireworks’ site is on the jetty near the entrance of the main channel. All boats will begin circling the main channel of the Marina at 6:00 p.m. Viewing: Spectators can view the parade and listen to live announcements at Burton Chace Park and Fisherman’s Village. The public can also watch the parade of boats from other local venues. Information: Visit the website online at mdrboatparade.org. Details: The Channel Islands Harbor is presents its annual Parade of Lights, themed “Fairy Tales Afloat,” which kicks off the holidays with a full day and evening of family fun, thousands of sparkling lights dancing on the water and the magical moment when Santa flies across the sky marking the beginning of the parade. Children’s activities and artists market will take place at Marine Emporium Landing, meet Santa (12-4 p.m.), snowplay in the morning and strolling carolers (5:30-8:30 pm). Parade begins at 7 p.m. and can be viewed throughout the harbor. Waterfront viewing is available from some restaurants & boat charters. For more information on how to become a vendor please visit rawinspiration.org or call 818-591-8161. Route: A route map is available online at bit.ly/2A0eDLu. Viewing: The parade can be viewed from parks and walkways that line the route as well as from most harbor restaurants. Boat charters are available for those who want to watch the parade from the water. Details: The theme for Ventura Harbor’s 41st annual Parade of Lights is “When You Wish Upon a Star.” Festivities kick off at 5 p.m., with the Parade of Lights commencing at 6:30 p.m. The event concludes with fireworks at 8 p.m. More than 30 vessels are expected to participate. The second evening of the boat parade will feature carolers, live reindeer, faux snowfall and photo opportunities with Santa Claus and Mrs. Claus. Information: Visit venturaharborvillage.com/parade-of-lights/ for more information. Details: Family festivities begin at Santa’s Village and culminate with a 5-minute fireworks display. The boat parade is preceded by Santa’s Village activities beginning at 3 p.m. on the City Pier in Santa Barbara Harbor (by the boats). Hundreds of families will come out to play in 10 tons of snow and take photos with Santa to get into the holiday spirit. The first 200 children receive free goody bags from Santa’s helpers. At 5:30 p.m. the annual boat parade begins with approximately 30 boats motoring, sailing, and paddling the Santa Barbara Coastline to the theme of Hollywood Holidays. Judging takes place at Stearns Wharf and boats are awarded donated cash and prizes in five categories. Best viewing locations include Stearns Wharf and the breakwater. Event admission is free. Forms are available now at the Waterfront Office, Harbor Market and Fuel Dock. Complete the form and turn in to the Waterfront Administration offices or email it to DSamario@SantaBarbaraCA.gov. Route: The Santa Barbara Coastline with judging taking place at Stearns Wharf. Viewing: Best viewing locations include Stearns Wharf and the Santa Barbara breakwater. Information: For more parade information contact the Harbormaster’s Office at 805-564-5531.